AZFJ › Forums › Arizona FJ Discussion › Expeditions, trail runs, or gatherings › FJ Summit 12! 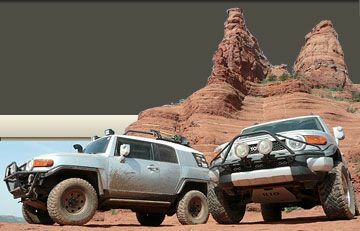 Forums › Arizona FJ Discussion › Expeditions, trail runs, or gatherings › FJ Summit 12! Posted: Thu Apr 12, 2018 3:50 pm Post subject: FJ Summit 12! If so...maybe we get an AZFJ caravan going! Posted: Fri Apr 13, 2018 6:35 am Post subject: Re: FJ Summit 12! Posted: Fri Apr 13, 2018 11:25 am Post subject: Re: FJ Summit 12! Yeah I'm a no-go this year too. Planning on maybe #15 in a few more years. Posted: Fri Apr 13, 2018 3:43 pm Post subject: Re: FJ Summit 12! Another no-go here. I hope to go again. Just don’t know when. Posted: Tue Apr 17, 2018 4:56 am Post subject: Re: FJ Summit 12! I’m going again....and on the Summit site noticed a LOT of folks from AZ going! Posted: Tue Apr 17, 2018 1:14 pm Post subject: Re: FJ Summit 12! Hi Deb, be sure to spread the word about AZFJ.org to any Arizona folk you meet in Ouray! Have a safe trip and have fun in Moab if you're doing that before/after again!! Are you making the cross-country trip again from VT or did you move closer? Posted: Tue Apr 17, 2018 1:31 pm Post subject: Re: FJ Summit 12! I mention AZFJ very often on the Blue Room and def will bring it up at Summit! Sporting my Arizona sticker and AZFJ decals. Would be great if I could get an AZFJ sticker, but haven’t seen them offered...any ideas? Posted: Tue Apr 17, 2018 3:13 pm Post subject: Re: FJ Summit 12! If you promise to Stick it on the mailbox up in Imogene pass, and post a picture, I'll send you one gratis. Maybe Bucket Boy can send you one for your rig! Posted: Tue Apr 17, 2018 3:46 pm Post subject: Re: FJ Summit 12! You got it!! I put stickers on that mailbox every year and take pics, so it would be my pleasure Would love to have another AZFJ sticker for my FJ - how to get in touch with Bucket Boy? Posted: Tue Apr 17, 2018 4:47 pm Post subject: Re: FJ Summit 12! I believe you just did. The one we put up there in 2012 was still there During the Summit X year but it was starting to get faded out. We found about the only open spot near the bottom. Posted: Tue Apr 17, 2018 7:13 pm Post subject: Re: FJ Summit 12! Simple. You just shoot me a PM. Although all the AZFJ stickers have been destroyed in a recent USPS accident so I have none at the moment. Will soon be doing some sort of “fundraiser” to re-order some more. Posted: Wed Apr 18, 2018 3:21 am Post subject: Re: FJ Summit 12! Hmmm...I am doing Imogene this year. I was thinking of purchasing a bunch of stickers and patches to trade while up there anyway =). Posted: Wed Apr 18, 2018 2:58 pm Post subject: Re: FJ Summit 12! Oh no! They look just like the patches? They look sooooo awesome...I bought 2 of those from you and they’ve traveled on my headliner ever since - get tons of compliments on them I really hope you can get the stickers back into production! What day are you doing Imogene? I’m leading a couple runs up there. Posted: Wed Apr 18, 2018 3:02 pm Post subject: Re: FJ Summit 12! Posted: Fri Apr 20, 2018 2:25 pm Post subject: Re: FJ Summit 12!